Inspired by the kid who collected 3000+ library cards, I thought I'd put up all of my library cards, too. Unlike his collection, though, these cards were all issued to me because I either lived or worked in the towns where these libraries are located. I didn't get them to build a collection - I just always use the library where I live. Even just with this small collection, it's interesting to see the variety in designs. This gave me the idea to create a Library Cards flickr group - how about showing off your library card? Posted under Library, Personal on Thursday, April 10th, 2008 at 10:30 am, by Brian Herzog. Post and comments available via the RSS 2.0 feed. Both comments and pings are currently closed. Didn’t we have UD library cards too or did we just use the Student ID cards? It was just our student ID – and since that had my picture on it, I didn’t put it up. 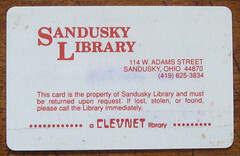 Kent State University was the same way – my student ID (with picture) was my all-access pass. I just discovered your blog a few weeks ago, decided it was one of my new favorites and now I find out that you are a fellow native Ohioan who shares my graduate alma mater. Cool. @Laura: I actually found that no matter where I go, I meet people from Ohio – but so far, very few are KSU-SLIS’ers. And thanks for the kind words about my blog – I hope Dr. Stansbury would be proud.